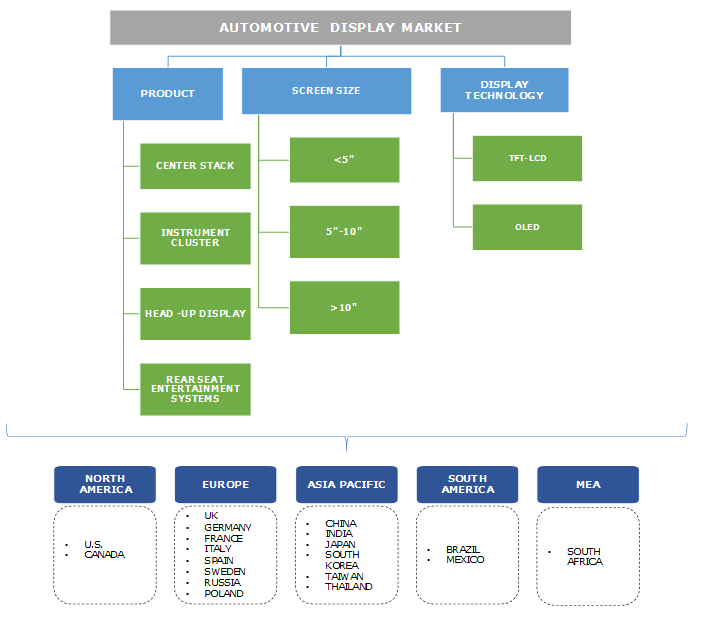 Automotive Display Market size estimated at over USD 15 billion in 2018 and will grow at a CAGR of 10% from 2019 to 2025. The global industry unit shipments are set to exceed 350 million units by 2025. The automotive display market has seen a rapid growth in the recent years. The key driver for this growth is the increase in global sales of passenger cars. The sales volume of passenger cars has increased from 50 million Units to 71 million units per year from 2009 to 2017. With increased disposable income, the demand for comfort as well as safety systems has also increased, contributing to the industry growth. Recent technological advancements such as ADAS, augmented reality, and artificial Intelligence have encouraged research and development for the automotive display market. Manufacturers are actively focusing on product innovations and differentiation for attain a competitive advantage. For instance, Denso developed the largest head-up display with 24-inch projection, which is featured in Lexus LS, a 2018 model luxury car. Companies such as Visteon are focusing on digital instrument clusters and are implementing curved displays by minimizing mechanical components. The development of augmented reality-based head-up displays is emerging in the market. These displays show situation-specific information including external objects. One of the challenging factors of growth in the market being the high cost of head-up displays. Many customers do not prefer to pay high prices for these systems. Display panels, such as OLED and QLED, are witnessing significant adoption in the automotive sector, contributing significantly to the overall system cost. The safety concerns that come with touch surfaces replacing all mechanical components are other reasons for restricting the growth of these systems. Complete touch surfaces are not yet as reliable as mechanical systems. A driver must look at the screen to operate it and it is a distraction from the road sight. This has been the case, especially in cars having large displays as Tesla. Center stack displays hold a major share in the automotive display market due to high demand in navigation systems and infotainment systems. The head-up displays segment also shows high growth potential. These systems offer high safety features in automobiles as they provide all the necessary information to a driver while looking at the road. The automakers are increasingly aligning toward digital instrument clusters from analog systems. These new instrument clusters not only provide basic information but also are used for navigations, infotainment controls, and other notifications. Rear seat entertainment display come mostly in the luxury cars segment. With the increased popularity of in-vehicle infotainment systems, customers are demanding more entertainment features in their cars. Rear seat entertainment systems consist of DVD/mp3 players, radio, and other features. Automotive displays are becoming larger in size with new features and ease of operation. 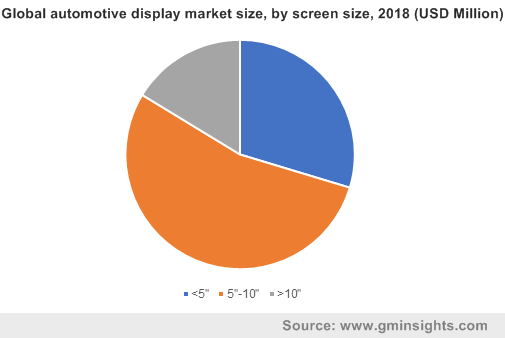 There is a growing inclination toward larger displays among consumers and manufacturers are responding to the demand by launching large screen monitors for passenger cars. Center stack display monitors are generally between 7” -10” but there is an emerging trend of larger displays in the market. Tesla Model S was the first high-end car to introduce a 17” display at central console in 2012, followed by Mercedes Benz S class with integrated instrument cluster and infotainment display system. Moreover, with the growing demand for head-up displays, larger screen monitors are projected to be a lucrative automotive display market. They have increased in size as more information projected on windshield will add more safety for vehicles. Denso implemented the largest 24” head-up display for Lexus LS in October 2017 while Sun Innovation came up with the first full windshield head-up display in 2015. Integration of instrument cluster, infotainment, and navigation systems with other functions in a single display is an important reason for increased sizes of automotive displays. Majority of the automotive display market have been acquired by TFT LCD screens. However, technological advancements in display technologies such as OLED, QLED, and AMOLED will create growth prospects for the market in the coming years. TFT LCD displays are relatively cheaper and commonly used but the display quality, visibility, and the sharpness are much better with OLED screens. With improvements in display features, manufacturers are focusing on high-quality display panels and the companies are investing more on research & development to improve the customer experience. The key reason for the adoption of OLED displays is that they can be used to make flexible as well as transparent screens. With thin plastic substrates, transparent films for head-up displays and flexible screen for curves in a car can be made, which has resulted in the increased adoption of OLED technology in the market. 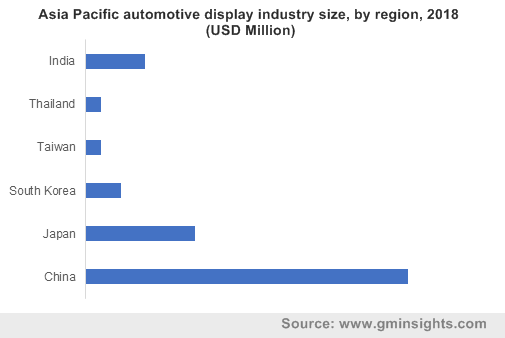 Asia Pacific holds the largest share in terms of revenue for the automotive display market. Manufacturers are expanding their manufacturing plants in Asian countries owing to the low cost of manufacturing and the availability of skilled labor. Large markets including India and China have seen an increase in the overall passenger car sales as well as sales of luxury cars such as Mercedes-Benz and Audi, augmenting the industry growth. Presence of telecommunication industries such as Huawei, China Telecom, and Bharti Airtel will also have an influence on the overall market in Asia with the demand for connected cars, IoT, and other technological advancements in car displays. 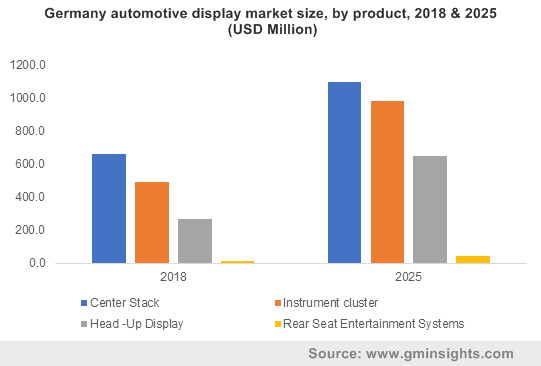 Continental AG, Denso, Robert Bosch, Visteon, and Panasonic Automotive are key players in the automotive display market holding majority of the revenue share. Japan Display, LG, Harman International, and Sun Innovations are some others with the significant presence. Considering the dynamic growth and high technological innovations, there are a considerable amount of opportunities left for new entrants. Byton being the one, which is a Chinese startup of e-vehicles, introduced the largest display of 48” in a production car at CES 2019, hence global leaders in the market also need to continuously focus on product innovations to be ahead of the competition. Some of the car manufacturers such as Toyota, manufacture their own displays and rear seat entertainment systems. The automotive display industry has seen a rapid growth in the recent years. As there is an increase in the disposable income of customers, it has been possible to adopt new features and technologies in vehicles. In addition, with developments in in-vehicle infotainment systems and instrument clusters, the display industry is expected to benefit from the ongoing trends. These systems have seen vast technological advancements with integration of features such as car navigation systems, touch displays, digital instrument clusters, and integrated displays with multi-functionality. The increased focus on research and development and competition have reduced the prices and more displays are being integrated in car interior systems. The increased need for vehicle safety due to accidental deaths is driving the demand for head-up displays and augmented reality, which focuses on driver’s attention on road, providing necessary information directly on windshield with external objects and basic information.